Word Artist is a simple guide is a delightful introduction to writing poetry. Your fourth-tenth grade student will be led through 3 units that introduce him first to poetic devices, then to non-rhyming poetry such as Psalms and haiku, and finally to rhyming poetry such as limericks. Each assignment comes with samples (many written by other students), and ideas, as well as a writing challenge. By the time your student has worked through this easy-to-use book, he will have written an entire "book" of poetry - a real keepsake! 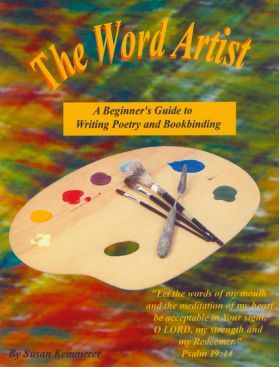 And, Word Artist even provides step-by-step instructions on bookbinding!